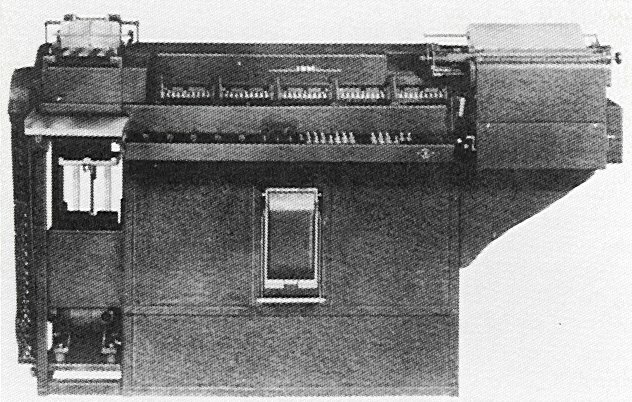 The IBM Type 285 Numeric Printing Tabulator, 1933, used in the Thomas J. Watson Astronomical Computing Bureau at Columbia University in the 1930s and 40s, in the Pupin Hall attic (transferred to Watson Lab in 1946). The card feed is at the top left and the card stacker below it a center left. The print unit is at the extreme right. Control switches are visible in the upper center, and above them the counter wheels of five accumulators. The 285 printed numeric data only and processed up to 150 cards per minute. The more expensive 405 (introduced 1934) could also print alphabetics. These were popular and long-lived models, IBM's biggest moneymakers until after World War II, and helped the new Social Security Administration automate its record keeping.